Israeli authorities have prevented the delivery of carbon dioxide to the Palestinian hospitals in the Gaza Strip, the Palestinian Ministry of Health said on Wednesday. According to a statement by the Ministry, the stock of carbon dioxide needed for refrigerators, ventilators and many other medical equipment is soon to run out. “This will worsen the already bad condition of the healthcare sector,” the statement read, stressing that many of the medical facilities would shut down. Therefore, the statement added, many of scheduled laparoscopic and ophthalmic surgeries would not be carried out. World Health Organisation (WHO) said that it had been trying to put pressure on Israel in order to resume delivering this necessary gas. 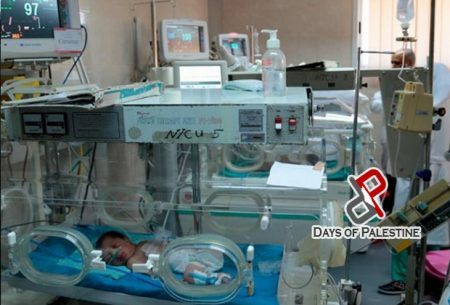 Gaza hospitals, WHO said, consume approximately between 150 to 200 kilograms of carbon dioxide every month. The international body called for the Israeli occupation to maintain the humanitarian needs of the Gaza residents far away from the strict siege that has been in place for more than ten years. WHO has called for keeping humanitarian issues aside from political conflicts to save lives of patients and heal their pain.